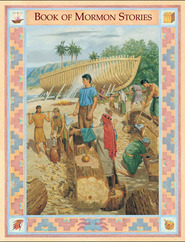 Illustrated Book of Mormon Stories is such an outstanding book and books of this lasting quality quickly become regarded as classics in their field. This one will be treasured by children and the adults who love them for years to come...Simply put, it is an over-the-top incredible volume." Click here to read the rest of this review. This was given to me as a gift for my son, but it is no easier to read than the actual Book of Mormon. In fact, I would say it is more difficult than scripture because the paragraphs are so long and dull. I can hardly make it through an entire story myself. The pictures are nice, but not enough to make up for the text. 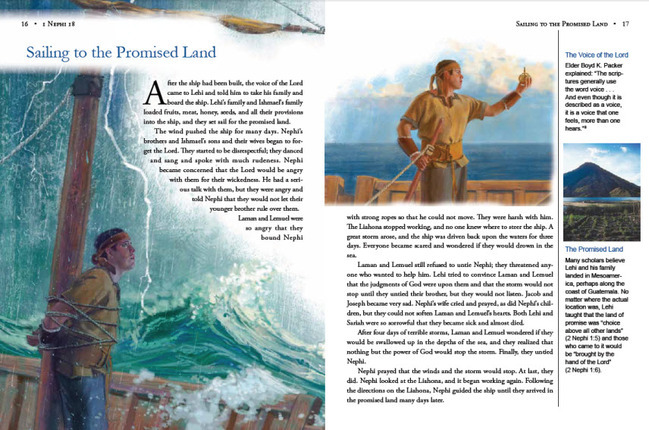 We've found it very helpful to read the summary of the stories contained in the Book of Mormon, written using words our children are used to hearing. We read the story from this book first, then read the verses in the BOM that match the story, and watch the BOM video clip. We don't necessarily do all three all the time, but I think it's wonderful to have different options to teach our children about the gospel. The book has also been helpful for me, as a convert, to quickly review the stories and help me gain a better mastery of the BOM characters. This book is well written and understandable from a child's point of view. I gave this to my grandson for his birthday and he is really enjoying it. Thanks for giving us something worthwhile and educational. We have five small children. While they love to hold their scriptures, and they know they are special, they get a bit bored during scripture time.. We often can't read enough scriptures in one sitting to get a full story read or explained. Basically we've really been wanting something to help capture their interest and help them learn the scripture stories more easily. We want them to love the scriptures and associate good memories & feelings with them that will last them their lifetime. This book is great at assisting the scriptures by explaining things on a more basic, summarized level. The illustrations are gorgeous and keep the kids interest because they want to know what is going on. Every night the kids are eager to sit and listen to learn what is going to happen next. 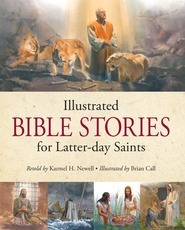 I love this book because I feel like its helping my children not only love the scriptures, but it's also helping them actually understand the stories. It's written using many of the same words as from the scriptures, so often I'll read parts of it, and then kind of reword it or ask them if they know what certain words mean (great for building vocabulary and scriptural understanding). Each story is just the right length. We read one each night. We still have scripture time, so this doesn't replace it, but it does help them understand better that these stories are in there. Thank you to the people involved in making this book. We love it. 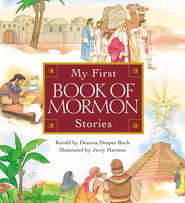 "Illustrated Book of Mormon Stories" is such an outstanding book and books of this lasting quality quickly become regarded as classics in their field. This one will be treasured by children and the adults who love them for years to come. ...Simply put, it is an over-the-top incredible volume." 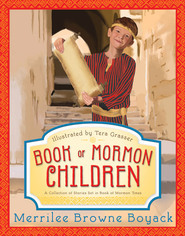 For a middle reader child who is learning more about the Book of Mormon. I was very excited to get this book. 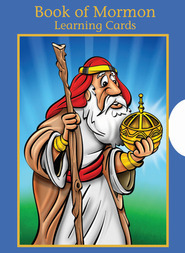 I’ve been waiting for a child’s version of BoM stories that was not cartoony for some time. Although the cover looked great, when I delved into it’s contents, I was very disappointed. First the text: The retelling is OK but fairly dull. It is also riddled with inaccuracies. Some may be editorial errors (on pg. 35 we are told that the plates of Ether were made of “ore,” not gold). Others are just not accurate: “The people of Zarahemla became known as the Mulekites.” (pg. 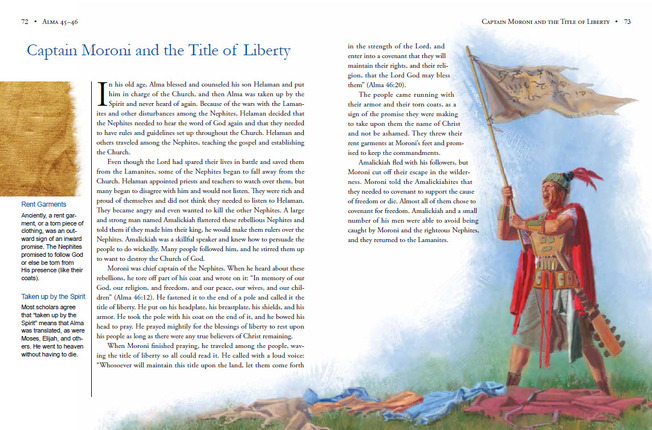 29), Amulon became the leader of the Lamanites (pg. 33), the stripling warriors lead the Lamanite army into the land northward (pg. 77) (according to the map on pg 64, those are the Jaredite lands – Alma 56:36 just says they fled northward – big difference), the words of Moroni are put in the mouth of Ether (pg 103) and so on. I consider the book small for the price but they did a good job including a wide range of stories. The layout is like a modern school textbook with a main text and educational tidbits on the borders. I don’t know if kids will like it but I did. I also like the inclusion of chapters on Lehi’s Dream, the Olive Tree Allegory and the writings of Isaiah all with great explanatory side notes. Well done! The art is plentiful throughout the book and is quite an improvement over what we’ve seen lately and for that I am grateful. The illustrator’s skill in digital painting is clear. Unfortunately, the casting, posing and costumes come off more as a stake roadshow than an authentic view of ancient life. If this vision of the BoM were to be believed, the ancient Americas were peopled entirely by Norwegians or other Scandinavians, who have modern hair-cuts, at times wear modern clothing (blouses on pgs. 61 and 83) and many bathrobes. This is now a world-wide church and there is no room for a vision of the BoM that is naively exclusionary. The Church has been working for years to try to help it’s members visualize the world-wide Church by providing much more diverse ethnic imagery but we seem slow to catch on. Page 110 shows the standard modern Mormon family reading the scriptures – they look like me, white European. That may have been the standard Mormon family in 1940 but it’s not anymore and we can’t keep illustrating it like that. With the work of a visionary art director and a knowledgeable editor, it wouldn’t have taken much to make this a really amazing project but for me these small faults add up to a book I’m not sure I’ll get much use from. I guess I’ll have to wait for the next attempt.